This was a recipe featured on The Lil' Peanut Patch and I've been wanting it ever since I saw it! I was a little nervous, but was very pleased with how it turned out! Heat a deep pot over medium-med/high heat. Add butter and onions. Cook and stir occasionally until they are somewhat caramelized. Then, season with salt, pepper, and thyme. Add sherry to the pot, slowly deglazing the pan as you pour it in. Then add the beef broth and worcestershire sauce. Let the soup sit on med/low heat for at least 20 minutes. While soup is simmering, turn on your oven to broil. Toast both sides of a thick slice of french bread. 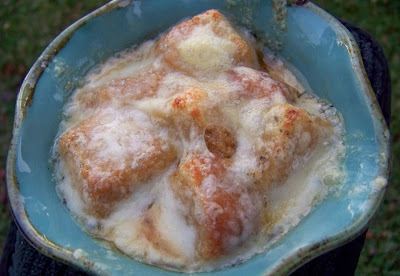 Then, place broiler safe bowls onto a cookie sheet and ladle the soup into your bowls, add the toasted bread (push it lightly into the soup) and lay a slice of cheese on top. Broil until the cheese is bubbly and lightly browned. YUM!